According to the weather forecast, we were in for a week of rain. So Will hooked up the triple axle equipment trailer and headed for Homestead Mills to pick up five 1,500 pound plastic bag totes of grain we’d spoken for. We were offered a very good price on this mixed grain (corn and oats) as one of their bins had been leaking into the next one, unknown to them. In short order, Will was back and started unloading the totes with our Oliver tractor’s pallet forks. Three went fine. Then one slid off the trailer and ripped open. 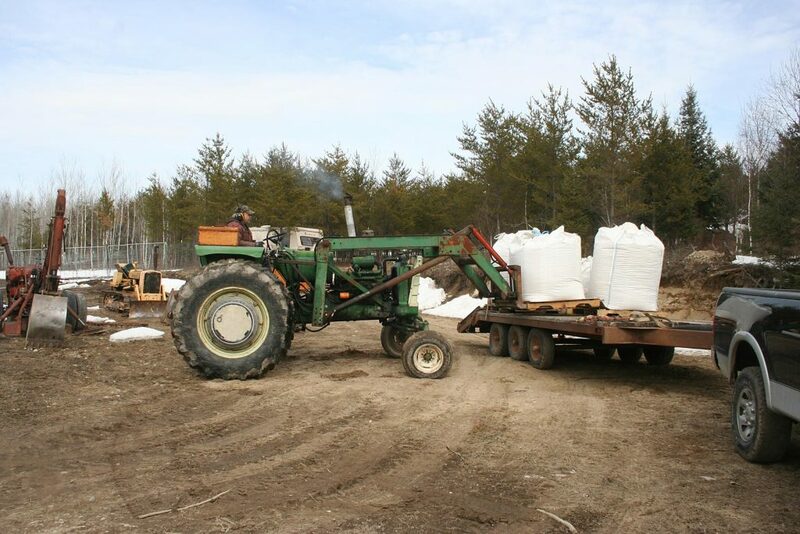 So he unloaded the last tote and was dumping it into our barge box wagon, which he had pulled out of the barn. But he raised the bucket too high by a few inches and both hydraulic cylinders came apart! Bad words! Bad words! It was getting late in the day and the rain was coming. The bucket had smashed down on the sides of the wagon, crushing one side pretty well. Luckily, we were able to raise the bucket with our Ford tractor’s bucket. And Will managed to get the cylinders back together. Whew! 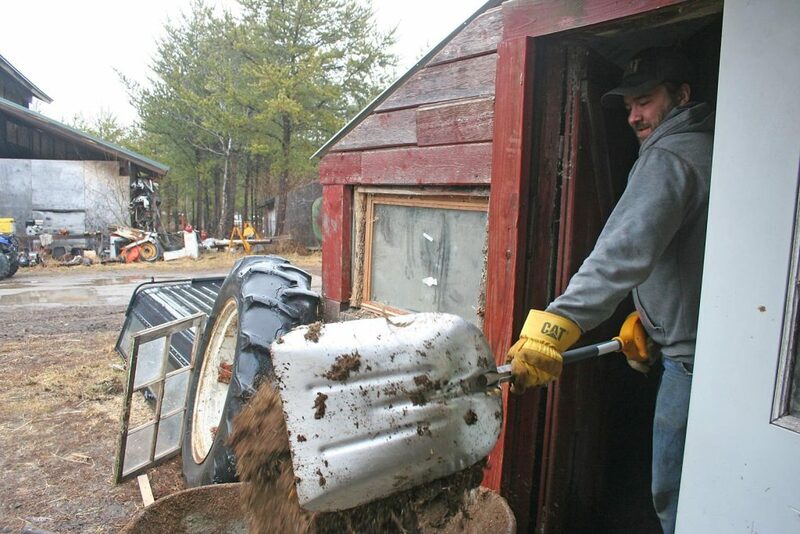 Then he had to shovel the spilled grain into the Ford’s bucket and dump that into the wagon’s box. But he got it done and shoved the wagon back into the barn, under cover. It’s nice to have all that feed, nice and dry. But boy, what a struggle. Will unloading the grain totes before the rain. David and Ashley moved home so he could begin working on his cabin once again. They brought a fiberglass 100 gallon watering tank with them, full of the 20 baby chicks and 2 baby ducks Ashley had bought so we could replace our coyote-killed flock of hens. Now they’re in the house as it’s too cold yet to go outdoors. Yesterday we moved our left-over roosters from the little coop to the duck house temporarily (until we can butcher them) so the chicks can be housed in that coop. There was two years worth of poop in there to clean out and two windows which needed replacing. David and Ashley took turns shoveling poop, dumping the wheelbarrows onto our little planting patch on the other side of the chicken yard. That’ll grow some very nice squash this year! Before the feathered out chicks can move out of the house, we had to give them a clean home. Ah spring in northern Minnesota! We are in the 5-7 inch range, but I have been so enjoying being able to see at least small patches of the yard. Just as long as our daughters prom is not canceled this weekend we will be good. Pretty dresses with winter coats and boots! Yup, it’s like my oldest daughters going trick or treating as ballerinas and fairies….in snowmobile suits! In December, we got 60 baby chicks and had them in the basement for about a month and a half until they were big enough to put in the coop. Cleaning out there cage was a constant thing or the smell was to much. They all survived with heat lamps and a well insulated coop once outside. Yep. Unfortunately we are off grid so heat lamps are out of the question but we’re putting them out tomorrow as it’ll be in the fifties with thirties at night. They’re over a month old so should do fine. wish you luck. love how you cheer your family on. hope we all have a good summer if not spring. Thanks Susan. Spring’s here again! I, too, have been watching that big, cold front. Creeping its way to the northern tier of the states. Lots of snow and cold. I was thinking you guys just dont need anymore bad weather. Hang in there and be safe. Thanks Jacquie! We were fine as were our critters. I transplanted the last of our peppers and tomatoes during the “blizzard” and baked peanut butter cookies. Baking always cheers me up! Years ago we started some chicks in a spare bathroom tub! The last few batches we brooded in a 150 gal plastic water tub in the green house. Mostly we could shut down the generator during the day if it was sunny. (We’re off grid) One year we had a mid May snow storm and had to run the green house wood stove for a couple days. I’ve seen your comming storm called a “Bomb cyclone” in two sources and some areas are supposed to get 20″! Yeah, that term “bomb cyclone” is a new one. We used to call it our April snow. I guess “bomb cyclone” sounds more dramatic…. We only got a little over a foot and that’s about all melted off and fifties (above!) tomorrow. One has to make hay as the sun shines as the saying goes. I always have to look twice as David is no longer little – I remember pictures of him in the magazine from years ago. Always nice to have time and/or money when a bargain/good deal presents itself. Necessity makes a poor bargain. Have you considered San Marzano tomatoes for your catalog? Yes, I also remember that little guy! What a big guy he’s become. And lots of help too. I’m so proud of all my “kids”! All work hard, have a good life, don’t do drugs or get drunk and are pleasant to those around them. It’s all I can ask. I’ve grown San Marzanos before and really like the paste tomatoes we are now growing even better. Choosing which varieties to offer in the catalog is sometimes very hard!